We recently had some discussion here about the changes to the Grand Hotel over the years. Les recently sent me these photos that document those changes. I have photos of the four phases of construction outline in the Wikipedia article. 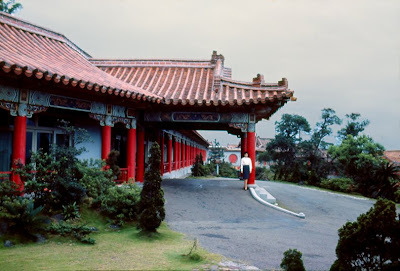 Here are the original building, the Jade Phoenix (Ch'ui Feng Ting) -- both photographed in 1962 -- and the Chi Lin Pavillion, which I shot in 1965. 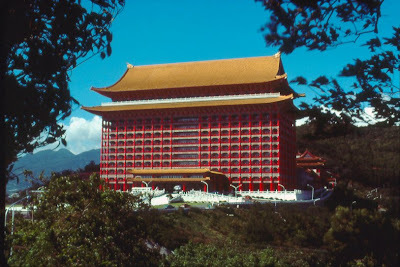 Finally, here's one of the current out-sized building taken in 1975. When that was finished in '73, a Chinese commentator quipped that they now needed to build a higher mountain behind it in order to restore a sense of perspective. 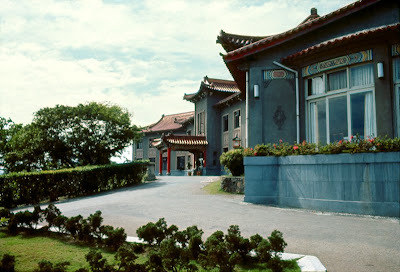 Your second picture above of the original building is the Grand Hotel that I remember from 1959-1960. 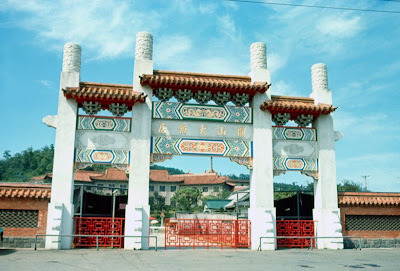 The gate in your first picture must have been added after I left. The original building had a grand location and was quite nice for that era. Thanks for refreshing my memory. You're certainly welcome. 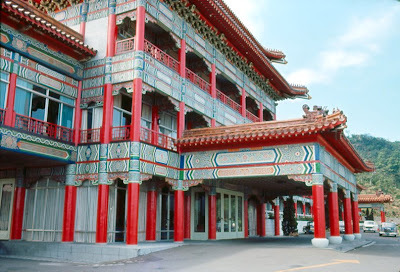 If I recall correctly, the original building had a pool and tennis court in front of it. When the new large building was built, it occupied all that space and a new pool, tennis courts and clubhouse were built down the hill in the direction of Club 63. In 1958 my family, Lt. Col. C. A. McAdams, wife, Gertrude, and I lived for six weeks in the Grand Hotel. The 2nd and 4th pictures remind me of how we would drive to a side entrance when I was driven home from school. The 3rd picture may have been the front entrance, but I do not remember that much "red" paint. Looking down from the front, though, I do remember how majestic it looked to see the tennis courts and swimming pool below the hotel.